The BFA program in glass has become part of the School of Art in the College of Art and Design. 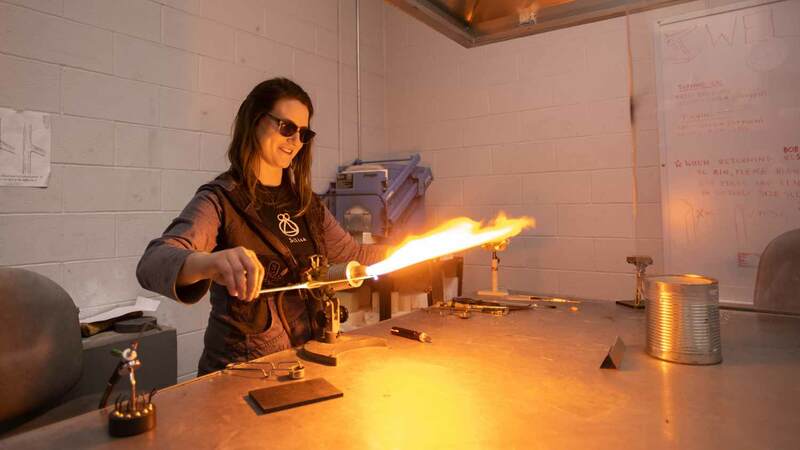 Students interested in studying glass should refer to the option within the BFA program in studio arts or contact the Office of Undergraduate Admissions for more information. The glass major focuses on comprehensive instruction, exposing students to artistic perspectives and opinions. The curriculum fosters effective artistic expression by teaching both techniques and idea realization within the field of glass. Foundations courses assist students in finding their voice and empowering them to identify a personal definition for their work. Students study the fundamentals of blowing, casting, and cold-forming. Idea generation, development, execution, and presentation are also explored. Self-promotion, gallery interaction, and business practices are especially emphasized, allowing students to pursue careers immediately after graduation. A selection of coursework from Tate Newfield '18 (Glass). This year’s fall crop of one-of-a-kind glass pumpkins and other favorites, created by students in RIT’s glass program, will be ready to be picked on Oct. 13 in the Gene Polisseni Center. This course covers topics commonly associated with the operation of a small business in fields related to the fine and applied arts. The one semester course addresses issues related to skills assessment, developing a sophisticated business plan, quantitative and qualitative business analysis, marketing, bookkeeping, legal issues and studio operations, etc. The course includes lectures, group discussions, independent study, studio and business visits, homework, papers, reports, and oral presentations. Each semester long course is structured as an independent unit. * Please see Wellness Education Requirement for more information. Students completing bachelor's degrees are required to complete two Wellness courses. † Art history electives are non-studio courses offered in CIAS or the College of Liberal Arts that examine the historical aspects of art, design, crafts, photography, print media, or film. ‡ Studio electives are courses designated by lab or studio contact hours in the course description. Design History courses examine our past, Contemporary Design Issues examines our future and will endeavor to explore key social, political, and economic events that influence and shape the contemporary and future practice of design. The impact of green design, economic sustainability, universal design and design for all, professional ethics, corporatization, and globalism, will be carefully examined. The subject of this course is painting, sculpture and architecture of the second half of the Dugento and the Trecento in Italy and its aim is to provide insight into the ways in which society and culture expressed its values through art;1250 marks the death of the last Hohenstaufen Holy Roman Emperor Frederick II and 1401 is considered by many to mark the beginning of the Early Renaissance, with the competition for the second set of bronze doors for the Baptistery of Florence. Artist students will study will include Nicola and Giovanni Pisano, Arnolfo di Cambio, Cimabue, Pietro Cavallini, Giotto, Duccio, Simone Martini, Pietro and Ambrogio Lorenzetti, Tino da Camaino, Andrea Pisano, Orcagna, Andrea Bonaiuti, Giusto de’ Menabuoi, Altichiero, and Paolo Veneziano. The works students will study will include altarpieces, private devotional images, mural cycles, tombs, churches, chapels, town halls, palazzi and piazze. Questions for consideration will include: the nature and meaning of this proto-Renaissance, the importance of Antique and Medieval precedents, the increasing attention to the effects of nature, the role of the patron, and the relevance of documents, literary sources and visual precedents for our interpretation of images. This course focuses upon Italian artists working in Italy from circa 1600 to circa 1750 and its aim is to provide insight into the ways in which society and culture expressed its values through art. Students will explore painting, sculpture, and architecture, and more or less chronologically in each major artistic center of Italy. Students will also have the opportunity to explore how these different media coalesce to create an overwhelming visual experience. We will pay particular attention to major commissions given to Annibale Carracci, Michelangelo da Caravaggio, Gianlorenzo Bernini, Alessandro Algardi, Francesco Borromini, Pietro da Cortona, Guarino Guarini, Filippo Juvarra and Giambattista Tiepolo, as we seek to define the nature and meaning of the Italian Baroque and Rococo. The subject of this course is 15th century painting, sculpture and architecture in Florence and Rome and its aim is to provide insight into the ways in which society and culture expressed its values through art; 1401 the year when the Calimala Guild announced a competition for a second set of bronze doors for the Baptistery of Florence and 1500 the year when Michelangelo completed work on the Roman Pietà. Artists students will study include Filippo Brunelleschi, Lorenzo Ghiberti, Donatello, Nanni di Banco, Luca della Robbia, Michelozzo, Leon Battista Alberti, Lorenzo Monaco, Gentile da Fabriano, Masaccio, Fra Angelico, Fra Filippo Lippi, Paolo Uccello, Bernardo and Antonio Rossellino, Andrea del Verrocchio, Antonio del Pollaiuolo, Sandro Botticelli, Domenico del Ghirlandaio, Leonardo da Vinci, Filippino Lippi and Michelangelo. The works students will study will include altarpieces, private devotional images, portraits, mural cycles, paintings and sculpture of mythological subjects, allegories, ceilings, doors, tombs, churches, chapels, palazzi, villas and piazze. Questions for consideration will include: the nature and meaning of the Early Renaissance, developments in artistic theory and practice, the importance of Antique and Medieval precedents, the increasing attention to the effects of nature, the role of the patron, and the relevance of documents, literary sources and visual precedents for our interpretation of images. The subject of this course is 16th century painting, sculpture and architecture in Florence and Rome and its aim is to provide insight into the ways in which society and culture expressed its values through art; 1501 the year when Michelangelo returned from Rome to Florence to begin carving the colossal marble David and 1600 marks the emergence of the Baroque style in Rome. Artists students will study include Leonardo da Vinci, Bramante, Michelangelo, Raphael, Sebastiano del Piombo, Jacopo Sansovino, Baccio Bandinelli, Jacopo Pontormo, Agnolo Bronzino, Benvenuto Cellini, Bartolommeo Ammannati, Giorgio Vasari, and Giovanni Bologna. The works students will study will include altarpieces, private devotional images, portraits, mural cycles, paintings and sculpture of mythological subjects, allegories, ceilings, tombs, churches, chapels, palazzi, villas, piazze, fountains and equestrian monuments. Questions for consideration will include: the nature and meaning of the High Renaissance, Mannerism, and the late Renaissance, developments in artistic theory and practice, the importance of Antique and Medieval precedents, the increasing attention to the effects of nature, the role of the patron, and the relevance of documents, literary sources and visual precedents for our interpretation of images. Students will study the history of artistic production and display in Paris, a city long regarded as a capital of the art world, from the Middle Ages to the twentieth century. The class will explore issues related to artistic production and display in Paris, including Paris as a center for Gothic production, art and the royal court, the intersection of classicism and French art, art and revolution, art and public space, Paris as a center of modernity, the role of historic conservation, and the role of museums. This course will examine Western art in the period leading up to the French Revolution and the early Modern period-generally, the mid-19th century. This process will include a close examination of the works and careers of individual artists who are considered some of the best-known representatives of the most significant art movements of the era, such as rococo, neoclassicism, romanticism, realism, and impressionism. Students will learn a new vocabulary for discussing visual representations and attempt to situate issues within political, religious, literary, and historical contexts. Throughout the course, a series of questions about art will be presented and students will assess how the nature of those questions affects the way they see images. A critical study of the art and visual culture of the first five decades of the twentieth century. Major stylistic movements in Europe and America will be examined with special attention to innovations in materials, subject matter, and philosophy. Central themes include: the relationship between art and politics, abstraction vs. figuration, primitivism, anti-modernism, and the search for origins, reactions to modernity and the rise of technology, the tension between the avant-garde and popular culture, utopian and dystopian views of art and society, the institutional critique, artistic responses to Phenomenology, Existentialism, Nihilism, and the special role of art and artists in modern society. Part I of a two-semester historical sequence devoted to 20th century art. A critical study of the art and visual culture of the second half of the twentieth century. Major stylistic movements in Europe and America will be examined with special attention to innovations in materials, subject matter, and philosophy. Central themes include: Abstract Expressionism, Pop Art, West Coast Junk, Funk and Beat, Nouveau Réalisme, CoBRA and Situationism, Arte Povera, Earthworks, Site Specificity, Allegory, Conceptualism, Minimalism, Feminism, Performance, Happenings, Installation, and New Media. Part II of a two-semester historical sequence devoted to 20th century art. A critical study of the art and visual culture of the last decade with a strong emphasis on the current American and international scene. The primary focus will be on living artists and artists who remain crucial to contemporary debates with special attention paid to recent, current, and forthcoming exhibitions, their methodological frameworks, and historical context, as well as the key critics, theorists and curators who are shaping the visual culture of the present. Students will study the history of Baroque painting in Flanders from the mid 1500s to 1700 with specific focus on women, gender and illness, and the birth of Early Modern Europe. We will consider the meaning of the Flemish Baroque, the observation and recording of natural appearances (still-life paintings), “hidden symbolism” and sacramental themes and connections between Flemish and Italian art. Peter Paul Rubens and Anthony Van Dyck are among the major artists to be studied in addition to those who are lesser known. A critical study of some of the major theoretical and philosophical texts that ground twentieth century art as well as their impact on artists and art historians/critics. Taken together they constitute what is presently called critical theory across a wide range of the humanities and social sciences, as well as the emergence of an alleged postmodernism. Major issues include: the theory of autonomy and self-reflexivity, the structuralist paradigm, post-structuralist and Marxist critiques of modernism, feminist approaches to spectacle, semiotics, and the theory of the sign, spectatorship, and commodity fetishism, the relation of vision to constructions of identity and power. Key authors to be discussed include: Lessing, Kant, Greenberg, Foucault, Barthes, Benjamin, Saussure, Pierce, Levi-Strauss, Lacan, Lyotard, Bataille, Debord Baudrillard, and Ranci. This course will focus on artists using their work for the purpose of changing society. Students will consider work by both individual artists and artists working in groups that cause critics, art historians, other artists and the viewing public to ask if what they are doing is art. Although there will be forays back to the 19th and early 20th centuries, most time will be dedicated to artists of the last three decades. We will examine texts that propose art to be a form of activism and persuade artists to be responsible for the way they represent the world - and maybe even determine if the goal of art is not to represent it in the first place. What is Art? What should Art be? What should Art do? But is it Art? are just some of the questions that are asked when art comes into contact with the political - especially when that art proposes to make a political or social change - i.e., when art becomes action. Although these questions may not seem immediately answerable, it is our responsibility to ask them and then attempt to answer them as best we can. The artists and theorists that we will discuss are concerned with problems in our society that effect gender, race, sexuality, poverty, labor issues, and the environment. Most of these theorists and artists can be classified as angry and confrontational or at least evoking a form of contestation and, therefore, their art and ideas are reflective of these positions. The image remains a ubiquitous, controversial, ambiguous and deeply problematic issue in contemporary critical discourse. This course will examine recent scholarship devoted to the image and the ideological implications of the image in contemporary culture. Topics will include: the modern debate over word vs. image, the mythic origins of images, subversive, traumatic, monstrous, banned and destroyed images (idolatry and iconoclasm), the votive and effigy, the mental image, the limits of visuality, the moving and projected image, the virtual image, image fetishism, the valence of the image, semiotics and the image, as well as criteria by which to assess their success or failure (their intelligibility) and their alleged redemptive and poetic power. In this course, students will examine the visual culture of ancient Roman civilization from the foundations of Roman culture through the Late Imperial era. Roman culture was heavily reliant on images as a means of transmitting concepts of lineage, status, and power; students will learn how these images may have been perceived in the context of Roman social and political history, and how style may have been used as an ideological tool. Students in this course will examine the history of illuminated manuscripts, learning about the working methods of artists as well as the cultural significance of the illuminated book. Issues of production, style, function, and patronage will be introduced, and students will explore the relationships between images, texts, and readers. A focused, critical examination and analysis of a selected topic in Art History varying according to faculty teaching the course. A subtopic course description will be published each term course is offered. This course can be repeated. This course will examine architecture, sculpture, painting, and decorative arts in Europe from the mid-12th century to the Renaissance. Students will analyze the visual culture of the period in relation to the historical, social, and political contexts of its production. Primary issues to be considered include the concept of Gothic, architectural design and construction, the format, function, and creation of manuscripts, art and religious practice, the status and organization of artists, artistic patronage, regional styles, and cross-media influences. This class covers the Gothic Revival of the 18th, 19th, and 20th centuries. Issues to be examined include the question of stylistic revival vs. stylistic survival; the origin and meanings of Gothic as a stylistic category; the impact of antiquarianism on the Gothic Revival in the 18th century; Gothic and 18th century modes of vision; Gothic in the private and public spheres; Gothic's associations with science, gender, nationalism, and morality; the Gothic Revival and the Pre Raphaelites, and major figures within the movement such as A.W.N. Pugin and John Ruskin. This is a survey course of the historical development of the art of Latin America from colonial times to the present. Included will be a consideration of painting, sculpture, architecture, graphic, and photographic arts. Potential themes to be addressed include the dependence on the European neo-classical academic model; indigenism; nationalism and the resurgence of popular art; the role of the visual arts in the construction of history; the conflicts and tensions involved in the search for a cultural identity. In this course, we will explore the history of world architecture from the late 19th century to the present. Issues to be considered include the definition of “modern” as it applies to the built environment; new building types; historicism; stylistic movements; urban development; housing; modern materials; critical theory and its impact on design; and architectural representation. This class will examine medieval European artistic production - including architecture, architectural and free standing sculpture, metalwork, painting, and manuscript illumination - from the 6th to the 12th centuries. The visual culture of the period will be analyzed in relation to the historical, social, and political context of its production. Primary issues to be considered include architectural structure, art and religious practice, the status and organization of artists and builders, art as an expression or enforcer of identity, the question of regional styles, contact with other cultures, and the relationship between medieval art and the past. This course explores the link between art and technology in the 20th century with special focus on the historical, theoretical, and ideological implications. Topics include the body in the industrial revolution, utopian, dystopian, and fascist appropriations of the machine, engendering the mechanical body and machine-eroticism, humanism, the principles of scientific management, the paranoiac and bachelor machine, multiples, mass production, and the art factory, industrial design and machines for living, the technological sublime, cyborgs, cyberpunk and the posthuman. Key theorists to be discussed include: Karl Marx, Norbert Weiner, Reyner Banham, Siegfried Gideon, Marshall McCluhan, Michel Foucault, Deleuze and Guattari, Donna Haraway, and Martin Heidegger, as well as examples from film (Modern Times, Metropolis, Man with the Movie Camera and Blade Runner) and literature (Shelley's Frankenstein, and Zamyatin's We). Artists covered include: Tatlin, Rodchenko, Malevich, Moholy-Nagy, Legér, Sheeler, Picabia, Duchamp, Calder, Ernst, Le Corbusier, Klee, Tinguely, Oldenburg, Rauschenberg, Warhol, Beuys, Kiefer, Lewitt, Fischli and Weiss, Acconci, Nam June Paik, Survival Research Laboratories, Bureau of Inverse Technology, Stelarc, Orlan, Dara Birnbaum, Roxy Paine, Marina Abramovic, Kac and Bill Viola. This is a survey course of native north and South American visual arts within an historical and anthropological framework. Included will be an examination of the development of principal styles of Ancient American architecture, sculpture, painting, and ceramics up to the 16th century when the Spanish conquistadors defeated the Aztec and Inca empires and imposed colonial rule. Consideration is also given to materials used, techniques of construction, individual and tribal styles, as well as to the meaning and function of various art forms within Native American societies. This course examines the widely influential mid-1960s art movement that questioned the fundamental nature of art itself by renunciating the material art object as well as the phenomenon of art making. The definition of art as well as its institutional framework was thereby expanded, and the idea, concept, or intellectual dimension of the work was underscored. Students will be acquainted with the philosophical foundations and critical implications of this global movement across a wide spectrum of works and practices (paintings, performance, installations, books and texts, photography, film, and video) and its relevance to contemporary concerns. This course examines the widely influential Dada and Surrealist movements in Europe and the United States from 1916 through the post-World War II period as well as their relevance to contemporary concerns. Emphasis is on identifying the major works of artists involved in these movements as well as their philosophical foundations, critical implications, as well as broader literary and ideological contexts (e.g., Freud, Breton, Lautréamont, Leiris and Bataille). A wide range of works and practices (paintings, performance, installations, literary texts, photography, film, and ephemeral objects) will be studied, and the work of certain key artists (Höch, Heartfield, Schwitters, Duchamp, Picabia, Dali, Ernst, Giacometti, Man Ray, Bellmer, Cahun, Cornell, Magritte, Miro, Oppenheim, Toyen and Picasso) will be analyzed in depth. This course is an inquiry into one of the major debates of modern art. This debate had a seemingly clear victor. The idea that the artist expresses his or her individuality and then communicates that self to the rest of humanity through a higher, transcendental, language has dominated the discourse and practice of modernist art. In retrospect, the art that dominated most of the first half of the 20th century was of an Expressive nature. On the other hand art that addressed the social and in anyway addressed direct and specific social issues was banished by art's major institutions. Realism was dead. In this course we will look at the circumstances of how Realism became subordinated to Expressionism. We will also address the question of what exactly constituted the practice of realist art. We will look at the roots of both movements that will take us at times into 18th and 19th centuries. But mostly we will concentrate on how institutions like the Museum of Modern Art helped define how we see the history of 20th century art as being determined. We will also explore how Modernism's other, Realism, survived and gained new currency in practices of late 20th and early 21st century art. This course brings together two of the most significant strains of recent art historical scholarship: the study of gender in representation and the critical examination of exhibitions and museums with particular focus given to key examples of curatorial practice from the late 19th century to the present day. Through readings, possible museum visit(s), class discussions, and guided individual research, questions of gender in exhibitions will be considered in relation to other aspects of identity including sexuality, race, and class. The Norwegian artist Edvard Munch (1863-1944) continues to generate a great deal of popular interest, critical scholarship, and reflection. The 4-volume catalogue raisonn of his paintings was published in 2009, and the graphic work appeared in 2001. A painter, printmaker, photographer, and filmmaker, Munch was also a prolific writer, well acquainted with the symbolist poets and playwrights, as well as the broad intellectual drift of the fin-de-Sicle. He is the one Scandinavian artist included within the Modernist canon and his image, The Scream (1893), is an icon of the modern age. Munch traveled widely throughout Europe and his work was exhibited in North America beginning with the famous 1913 Armory Show. This course will examine recent scholarship devoted to Munch and the critical issues that his work addresses. It will also place him within the broader cultural context of Scandinavian and European modernism, while examining his impact on subsequent generations. The term avant-garde was originally used to describe the foremost part of an army advancing into battle. The concept of the avant-garde is considered by some to be synonymous with Modernism. The radical move away from classical forms of representation in the late 19th and early 20th centuries is typical of how one understands the avant-garde. In Russia, the experiments in art from the mid 1890s through 1922 are seen as modernist avant-garde practices that were extreme departures from art practices of the earlier 19th century. And although this art is very often described, like other western art of the period, in terms of form rather than with regard to its ideological content. We will examine the avant-garde's social and, therefore, political underpinnings. In order to get to the roots of an earlier understanding of the avant-garde, we find in its beginnings the writings of Claude Henri de Rouvroy, comte de Saint-Simon, and Olinde Rodrigues. In Russia the artists who painted images that represented the social world, and therefore put themselves in opposition to the status quo, were known as the Peredvizhniki. We will try to amend this misunderstanding and connect this group of artists to the Russian formal and political avant-garde of the early 20th century and to the latter non-conformist artists of the second half of the 20th century that coincides with Perestroika and the eventual demise of the Soviet Union. In this course, we will explore the history of craft production throughout the Middle Ages. While modern scholars have often divided art from craft, this distinction did not exist in medieval Europe: artists were craftspeople, producing objects that were both practically and symbolically functional. This class will focus on the decorative arts including stained glass, ivories, textiles, and metalwork to produce a more integrated picture of medieval visual culture. Students will study both practical aspects of production and the reception and meaning of these objects within medieval society. This course will introduce students to historic, contemporary, and critical issues surrounding installation art. There will be an introduction to the development of installation art as a genre. 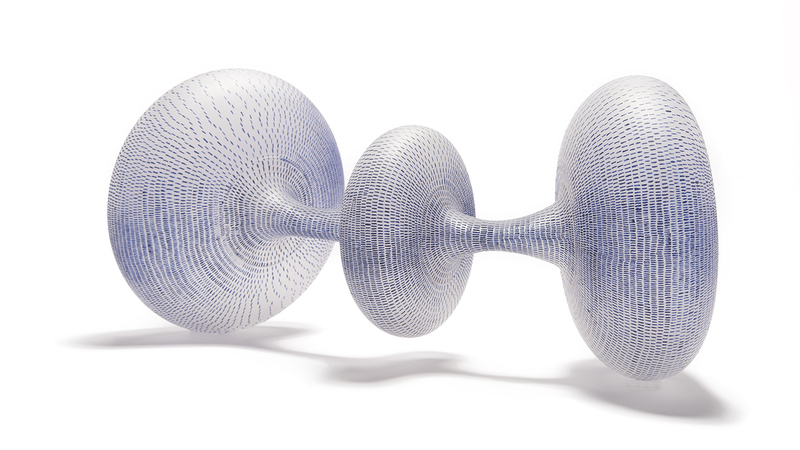 We will examine the changes, which have developed over the past three decades, of object sculpture to non-object. There will be an emphasis on the development of the concept of an installation project and its relationship to site and/or audience. Both public and gallery spaces will be discussed. This course is an examination of techniques and materials together with a historical overview of the artistic achievements of craftsmen and women in the past, with particular emphasis on ceramics and metalsmithing. It includes study of Renaissance and early modern earthenware and stoneware as a prelude to the consideration of the history of porcelain and explores creative thinking and designing in other traditional craft areas such as fiber, glass, and wood. This class will examine the Gothic cathedral and related art production (stained glass, sculpture, and metalwork within the cathedral context) from the 12th through the 15th century. Students will study cathedrals of the late middle ages within their cultural contexts and examine the meanings such buildings conveyed to their intended audiences. The class will explore the design, structure, and construction of Gothic cathedrals throughout Europe, and will also examine the decorative programs of sculpture, stained glass, and liturgical objects integral to the meaning and function of these structures. Issues to be considered include the production of cathedrals; the stylistic variations of Gothic; the relationship between function and form; the urban context of Gothic cathedrals; and the holistic view of the Gothic cathedral. This course explores the links between psychoanalytic theory, art history and visual culture with special focus on the work of Sigmund Freud, Carl Jung, and their followers. A central aim is to examine the way in which psychoanalytic theory has been employed by art historians and theorists as a mode of interpretation, as well as to study how, why, and what several of the most notable psychoanalysts have written about art. Topics include the interpretation of dreams, transference, the Oedipal myth, melancholia, narcissism, abjection, the structure of the unconscious, the fetish, Archetypes and the Collective Unconscious, as well as outsider art, and the art of the insane. Key theorists to be discussed include: Freud, Jung, D.W. Winnicott, Melanie Klein, Jacques Lacan, Otto Rank and Julia Kristeva; individual artists studied include: Albrecht Drer, Leonardo da Vinci, Edvard Munch, Lars Hertervig, Max Ernst, Jackson Pollock, Antonin Artaud, Louise Bourgeois, Mary Kelly and Victor Burgin; in addition to examples from film (Maya Deren, Luis Bu uel and Salvador Dali, and Stan Brakeage). * This course is required for students in majors in the schools of American Crafts, Art, Design, and Photographic Arts and Sciences (BFA programs only). † This course is required for students majoring in interior design and furniture design. 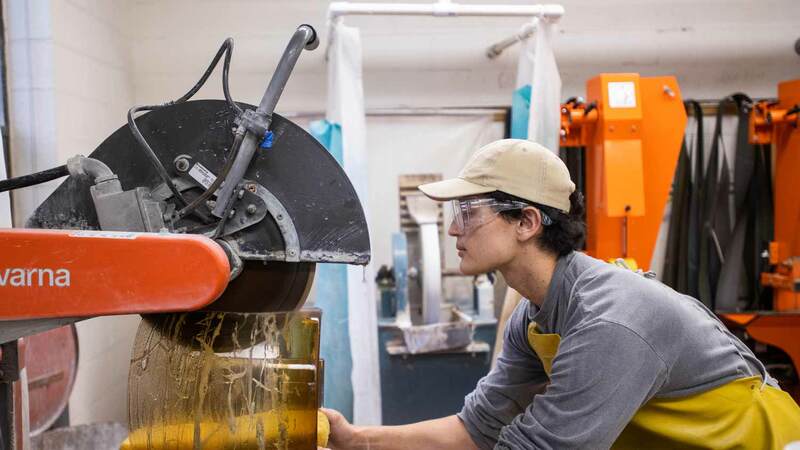 The School for American Crafts offers a Studio Residency program for students in ceramics, furniture design, glass, and metals and jewelry design. Residence positions are limited and are awarded after the review of all applicants’ portfolios, transcripts, and references. An interview is required. Accepted residents are required to register for one independent study credit during each semester of residence. 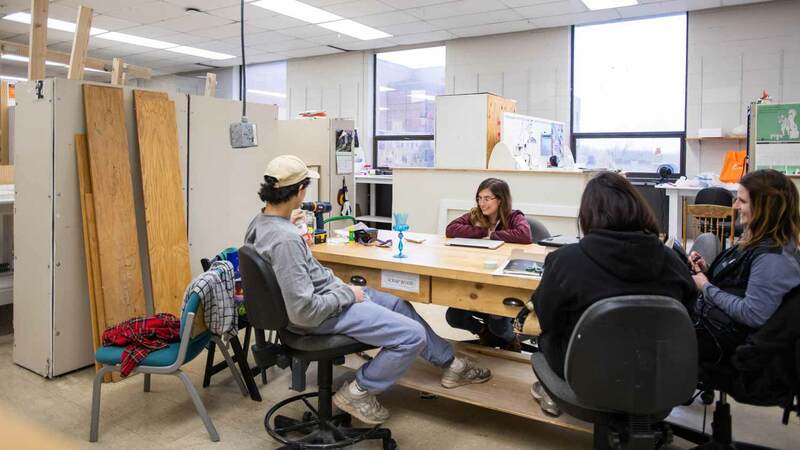 Accepted residents are expected to be present in their assigned studio during class hours and to contribute up to 10 hours of work per week in the main studio. These work hours are coordinated and overseen by the faculty in the resident's discipline. In exchange, the school will provide workspace, access to facilities, and supportive instruction. The resident is invited to participate in the full range of studio activities. Participants may be those seeking additional studio experience prior to undergraduate or graduate study, early career professionals, or teachers on leave who wish to work again in an academic studio environment. The faculty in each discipline make decisions concerning appropriate candidates. Inquiries should be made to the Studio Residency Program, School for American Crafts, College of Art and Design, Rochester Institute of Technology, 73 Lomb Memorial Drive, Rochester, NY 14623-5603.